Posted in: Meetings. Tagged: drones, dust devils, Mars. Dust devils are low-pressure, small (many to tens of meters) convective vortices powered by surface heating and rendered visible by lofted dust. The dust-lifting capacity of a devil likely depends sensitively on its structure, particularly the wind and pressure profiles, but the exact dependencies are poorly constrained. In this pilot study, we flew an instrumented quadcopter through several dust devils to probe their structures. Posted in: Public Outreach. Tagged: exoplanets, public astronomy event. This is the sharpest image ever taken by ALMA — sharper than is routinely achieved in visible light with the NASA/ESA Hubble Space Telescope. 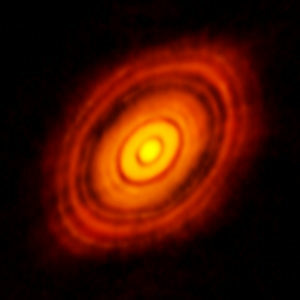 It shows the protoplanetary disc surrounding the young star HL Tauri. Exoplanets are being discovered from near and far, and one way to learn more about how these planets form is to study the disk of gas and dust from which they form. Join the Boise State Physics Department on Friday, Oct 6 at 7:30p in the Multi-Purpose Classroom Building, room 101 to hear Prof. Hannah Jang-Condell of the University of Wyoming discuss her cutting-edge research on these protoplanetary disks and how the telescopes at University of Wyoming are being used to better understand and characterize exoplanets. At 8:30p after the presentation, we will stargaze on the roof of the Brady Street Parking Garage, weather permitting.